Located 2200m above sea level, Shimla is the capital of Himachal Pradesh and one of the most popular hill stations in northern India. The newlyweds and Indian families fleeing the summer heat come and take refuge there. 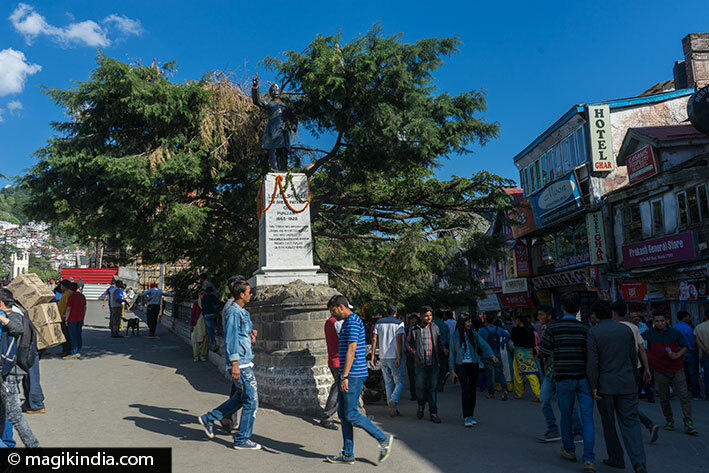 At the end of the 19th century, Shimla was also the British Raj’s favorite destination due to its ideal location between green hills and snow-capped mountains. They made it their summer capital and left there many refined edifices that make the charm of the city. 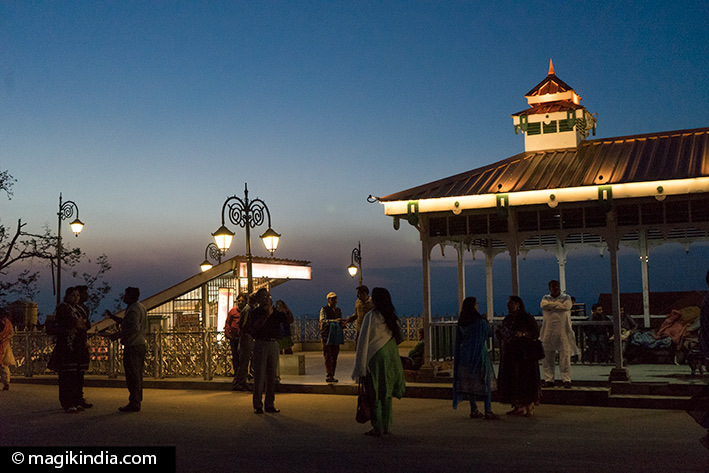 Shimla is a peaceful stop before heading to the Kinnaur Valley or the North of the State. 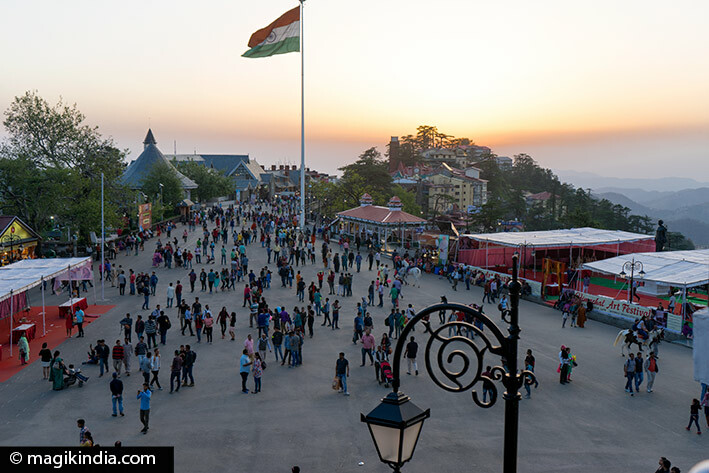 The Ridge is the heart of Shimla. We can’t miss it. Located above the Mall Road, it is a large open space where visitors gather to stroll and admire the surroundings. The ‘Ridge’ stretches to Scandal Point and leads to the Lakkar Bazaar in the east. Note that the Ridge is non-smoking and prohibited to cars. Scandal Point is located at the intersection of the Ridge and the Mall Road, nothing special to see, it is a meeting point where stands the statue of Lala Lajpat Rai, a Punjabi politician and writer, popularly called Punjab Kesari who fought for the independence of India. 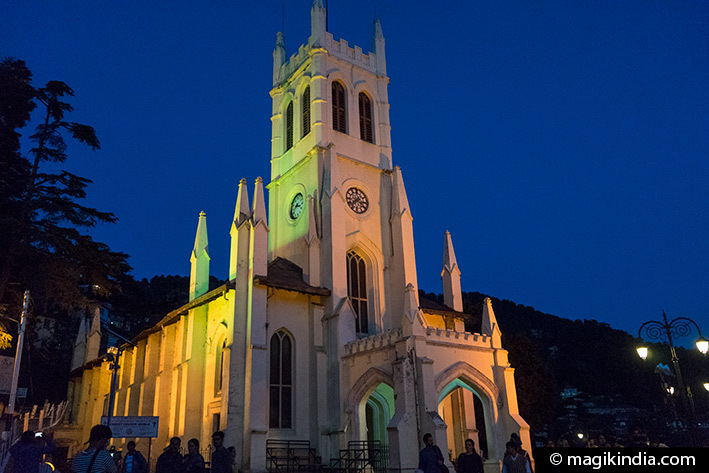 Christ Church located east of the Ridge, next to the municipal library, is part of the Shimla postcard. 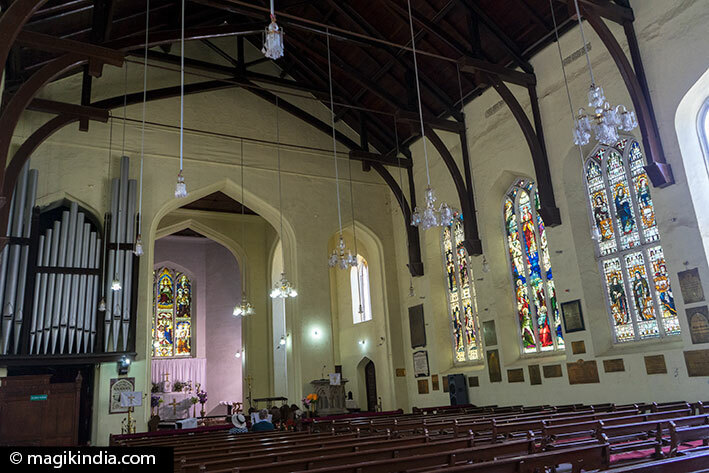 Built in 1857 according to the design of Colonel J. T. Boileau, it shows a neo-Gothic architecture; The stained-glass windows are particularly remarkable and illustrate peace, hope, charity, courage, patience and humility. 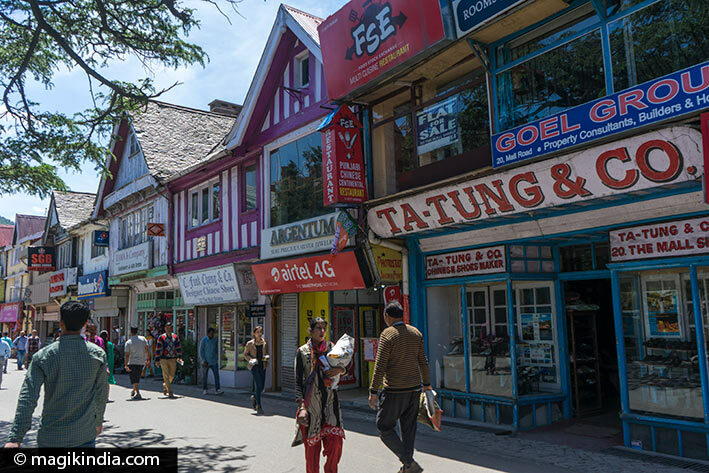 ‘Mall road’ is the most famous street in Shimla. 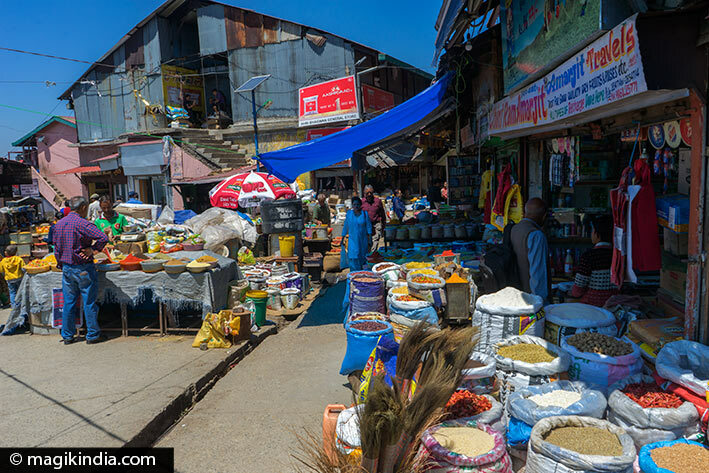 Located below the Ridge, it is a long modern pedestrian street, lined with shops of all kinds (major sports brands, handicrafts, bookstores …) and restaurants, cafes, travel agencies, banks … etc. 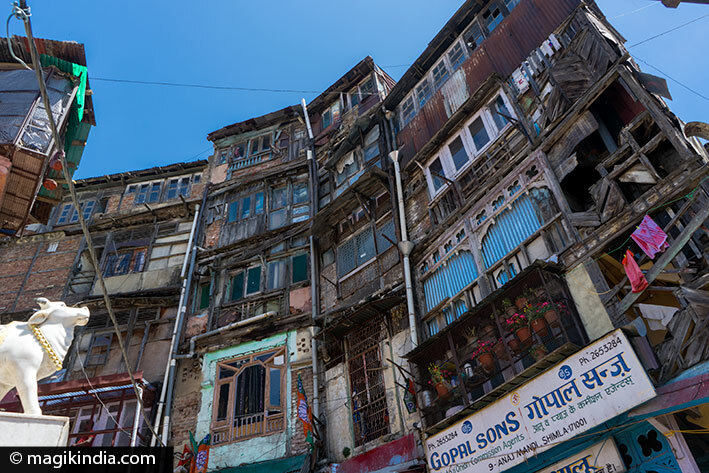 Below the Mall Road, we reach through narrow alleys, the much more typical ‘lower bazaar’ lined with grocery stores, Indian clothing, restaurants and wooden buildings crumbling under the weight of time. Several Hindu temples (Laxminarayan temple) as well as a wooden mosque are also worth a look. 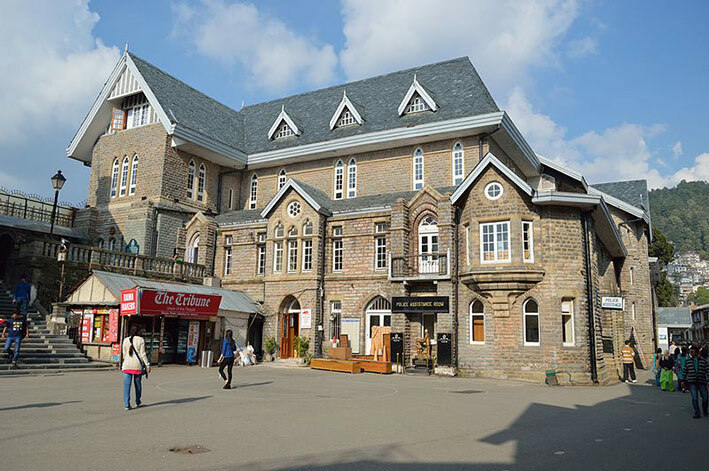 Located on Mall Road and designed by Henry Irwin in 1887 in a Gothic Victorian style, the Gaiety Heritage Cultural Complex is an artistic and cultural center. It hosts theatrical performances and a gallery of contemporary and traditional arts. Guided tours are organized in small groups. Shimla Town Hall is next door. The building, built in 1908, boasts a beautiful half-timbered Tudor architecture. It is currently under renovation (April 2017). 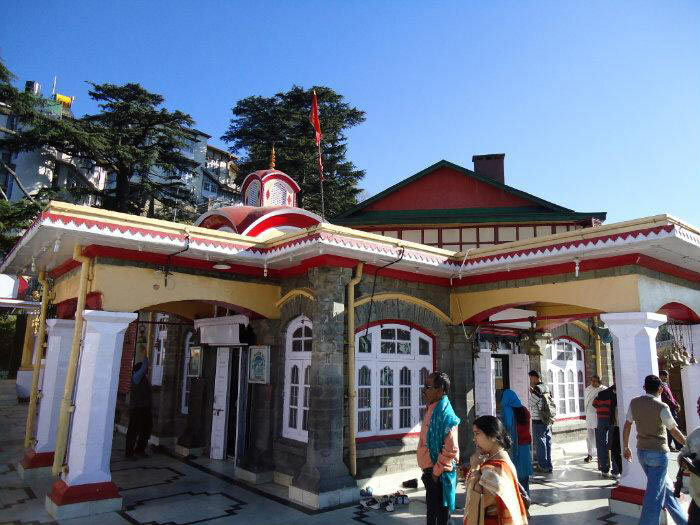 The Jakhoo temple is the most famous Hindu Shrine of Shimla. 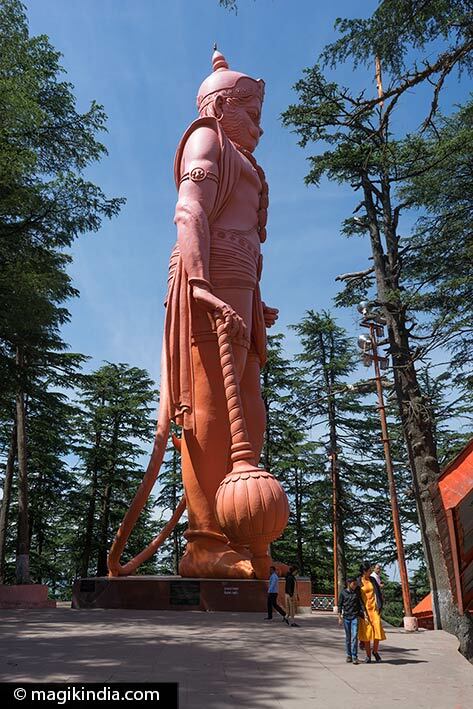 Dedicated to Hanuman, the monkey god, he stands at the top of Jakhoo hill at an altitude of 2455 m and its 33 m high statue is visible from afar; It is one of the biggest effigies of the god Hanuman in the world. It can be accessed by cable cars, 15 minutes east from Christ Church or on foot from the Rothney Castle through a pleasant trail dotted with conifers. Beneath Hanuman temple is another temple dedicated to Sidh Shri Baba Balak Nath Ji. Baba Balak Nath or Sidh Baba Balak Nath is a Hindu deity revered in Punjab and Himachal Pradesh. It is one of the reincarnations of Kartikeya, son of the god Shiva and goddess Parvati. He was born to annihilate the Tarkasur demon. Besides the idol of Kartikeya, there are also statues of Laxmi-Narayan and a Shiva-lingam in the sanctuary. The Kali Bari temple dating from 1845 is dedicated to one of the incarnations of the fierce goddess Kali, known as Shyamala. 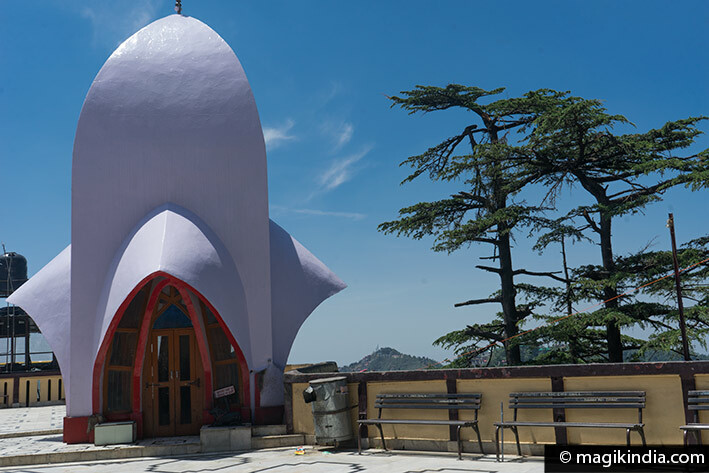 It is said that the city of Shimla derives its name from the goddess. 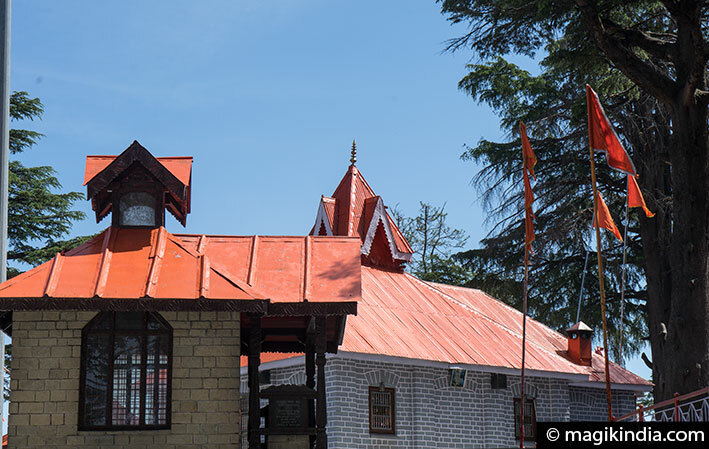 Located above the buildings of the Indian army, the sanctuary receives a constant number of worshipers venerating the wooden statue of the goddess, especially during Navaratri festival. It is said that the original temple of the goddess Shyamala was situated on Jakhoo hill and was then moved to its present location. The Viceregal Lodge also known as Rashtrapati Niwas is located on Observatory Hill, 4km from the Ridge. It was formerly the summer residence of the British viceroy of India. The building, completed in 1888, was designed by the British architect Henry Irwin in a mixture of classical and Gothic architecture. 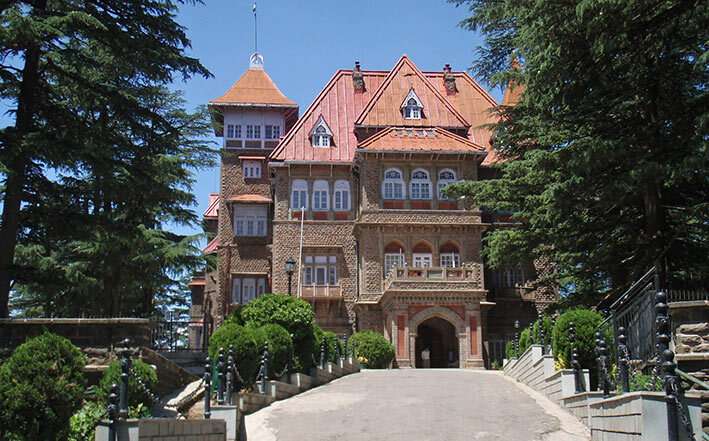 Only a few rooms can be visited like a small museum showing photographs of Shimla during the British Raj. The building has now been converted into an Universty (Indian Institute of Advanced Study). 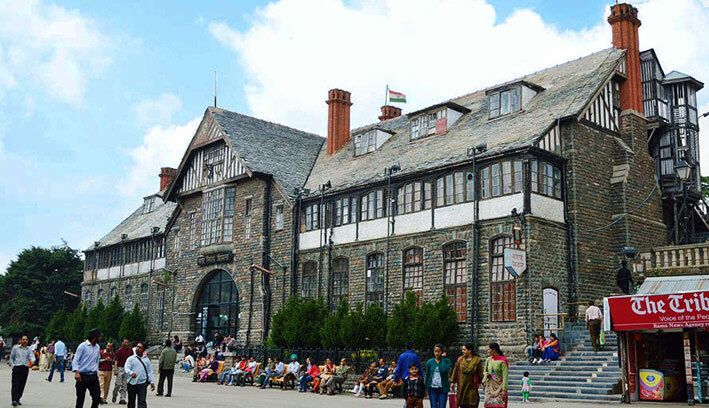 Located on Mall Road, Shimla’s Post Office is one of the oldest post office in India. 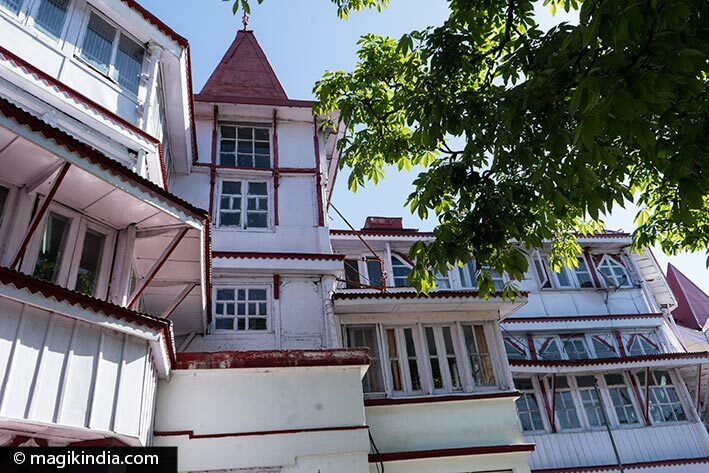 The building was originally known as “Conny Cottage”, the owner of which was the director of the Shimla bank, Mr. Petterson. The building of the railway company is located on Mall Road in front of Gorton Castle. This four-storey building completed in 1897 is a wonderful example of the British architecture. It shows a cast iron and steel structure to make the building fire resistant and beautiful spiral iron staircases. Gorton Castle is located high up in front of the Railway Board Building. 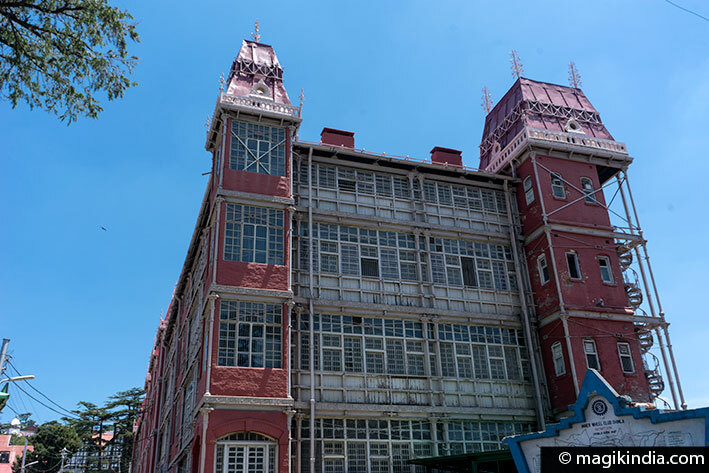 The 125-room building was built in the mid-19th century by a renowned British architect Sir Swinton Jacob and features Gothic architecture combined with rajasthani elements such as balconies and sandstone jalis that give it a particular charm. Formerly, the building served as the secretariat of the Imperial Government of India and included various ministries. 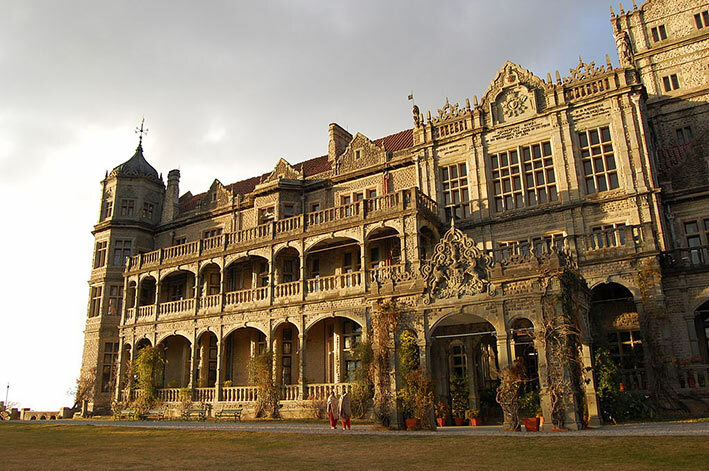 At present, Gorton Castle houses the offices of the General Accountant of Himachal Pradesh. Being a government building, it can only be seen in a certain distance.